Finally got some observing time in last night, and on my target list, along with the usuals, was M38, the open cluster in Auriga, and M1, the Crab Nebula in Taurus. I also tried Mars, but the seeing was too bad to make out any real detail. First stop, M38. This open cluster is a fairly rich cluster, at approximately 200 million years old. It is about 25 light years wide, and roughly 4,200 light years distant. It was discovered before 1654 by Giovanni Batista Hodierna. It has an apparent magnitude of 7.4. Image Courtesy of Ole Nielsen. 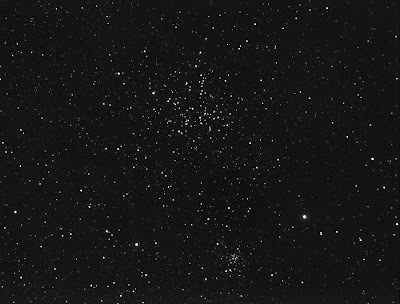 The above image shows M38. I chose this image because it closely represents what I saw at the eyepiece of my Zhumell 10" Dobsonian. I had trouble finding it at first, but when I did, it really jumped out! Mostly the cluster was composed of resolved stars. The brightest star of the cluster, a bright yellow star, stood out well. I spent quite a while observing this cluster, until clouds moved over it. Next was M1, the Crab Nebula. 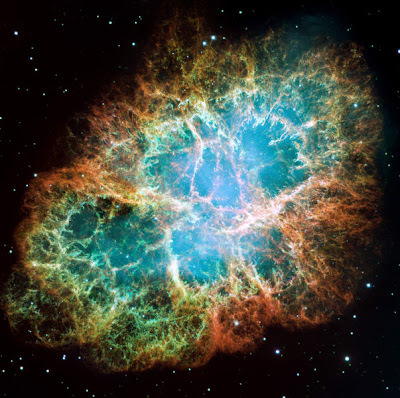 The Crab Nebula is an emission nebula, left over from a supernova recorded in 1054 AD. It was discovered in 1731 by John Bevis. The Crab Nebula is about 11 light years across and about 6,300 light years distant. The outer reaches of the emission nebula are rushing away from the central star at about 1,500 kilometers per second! M1, The Crab Nebula, a remnant of a supernova in 1054 AD. Relatively easy to find, but also relatively dim from my location, the Crab Nebula was best seen with averted vision. The above image is in no way a close approximation of my view. There was no color and no filamentation was apparent, as transparency by now was decreasing rapidly. Clouds moved over Taurus before I had a real good chance to observe it well. I should be getting some more clear skies tonight, so look for a possible report on the Quadrantid meteor shower!